If you are a beginner at bush-crafting and not sure of what knife you should start your adventure with, then the Morakniv is the perfect weapon for you. It is important for any bushcraft enthusiast to choose a knife that is most suited to them, especially if you are a beginner, and this Swedish knife has proven to be one of the best out there for beginners to start their journey with bush-crafting. Easily slicing through leaves, batoning pieces of wood, sharpening and carving branches to make weapons, this knife has one of the sharpest blades you will ever come across. Moreover, the knife’s lightweight, firm grip on the handles, and the price that it comes with, makes it the ultimate contender in the market for beginner knives. 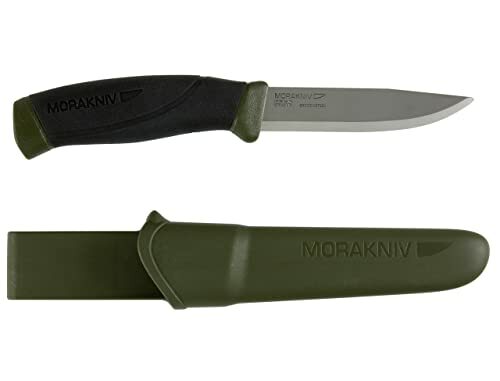 The Morakniv boasts a Swedish-made, carbon steel blade. The blade itself is 0.08 inch thick and 4.1 inches in length which adds to the overall 8.6 inches of the knife and is just enough to make the knife portable and comfortable to carry around. With the dimensions mentioned, there is no doubt that the knife will be a valuable possession for any wilderness enthusiast while they are out into the wild. Although the blade is not a full-tang, it is exceptionally tough and performs its job seamlessly. Food preparing, making a fire, slicing wood, hunting- you name it, this blade can handle any type of task with perfection. The handle is a simple, lightweight piece and very easy on the hands. The patterned grip on the handle establishes a firm grasp of the knife; this makes it very comfortable and saves you from getting any blisters on your palms. The guard on both sides keeps your hands from sliding off and lose control of the knife in case of some heavy duty bush-crafting. The design of the handle is worth mentioning because, without much fancy ornamentation with special grips or palm swells, the handle serves its purpose beautifully and forms a perfect marriage with the blade that comes with the knife. The sheath is simple, lightweight and made out of plastic. There is nothing fancy about the sheath, but it sure does its job. It also comes with a hook that you can attach to your belt when you are out into the wilderness; this is more convenient than other attaching techniques in the sense that you do not have to take your belt off and loop the sheath through. In addition, there is a drainage hole to let out any moisture during humid days or if your sheath gets soaked somehow; this prevents the knife from rusting. Another feature worth mentioning about the sheath is that it has a thumb ramp on the corner which comes in handy when you want to push the knife out; although a small feature, but it’s the little details in the designing of a product that sets it apart from the other knives in the market. Whether you are a camper or a hunter, a wilderness enthusiast or a hiker, this knife will definitely be one of the most valuable tools for your outing. Its simplistic design, lightweight and durability, place it in a higher position than most other knives in the market. In my opinion, this knife will be even better for someone just starting out bush-crafting because it is one of those knives that give you a raw experience of what a knife is, keeping away any fancy embellishments. All in all, it can be safely said that the Morakniv will be a great value for your money.